I said that I wasn't going to do any more speculating about Knights of the Fallen Empire until we had some actual new information to discuss, but just knowing that changes are coming - even without knowing what they will actually look like in detail - can still serve as an inspiration. Calphaya from Spawn of the Dread Masters used the subject of gaining and losing companions as an excuse to talk about which companions she'd definitely like to keep this week (if she was given the choice to lose some). I found that post and her explanations very interesting, especially as my own picks would have been very different. So I thought: Why not tackle the subject myself? So without further ado, eight companions that I wouldn't want to lose - I decided to choose one for each base class. Since my main is a trooper, I considered the trooper companions first. Since I like pretty much all of them (with the possible exception of Vik), I thought that I would have difficulty picking a favourite, but in the end it wasn't really that hard after all. 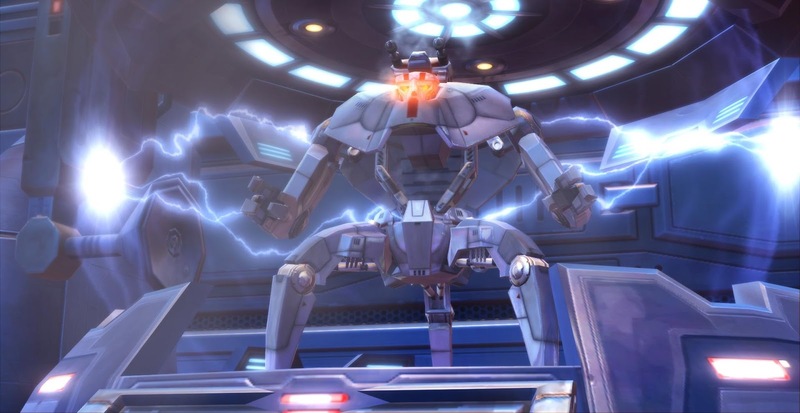 The one companion I would really hate to lose (even though I rarely play with a tank companion out) would be that lovable killer droid M1-4X, and not just because he used to have droid boners for me. His unbridled enthusiasm for all things Republic, combined with the fact that he's a highly efficient killing machine, is just too endearing and funny. Unfortunately I can't see there being much room for his particular flavour of patriotism in a galaxy in which the Republic has been reduced to insignificance. When I levelled my first consular, I was quite disappointed that Zenith wasn't a romanceable companion and I found other voices on the official forums expressing the same sentiment. He's a cold-hearted killer and the kind of bad boy you know you wouldn't want to get too close to in real life, but in a fantasy setting you can't help but dream of bringing out the good in him somehow. Even without a romance option however, Zenith is a very interesting companion, a former terrorist that wants to become respectable but who also has huge trust issues and can't quite let go of his roots (and is therefore shunned by his government). Of my Jedi knight's companions, the one I would miss the most if I lost him would probably be Lord Scourge. He's probably the only dark side companion I can think of that never annoyed me. His willingness to work with a light side Jedi for his own (still dark side) reasons is simply fascinating. As many others have stated, it's a shame that Shadow of Revan didn't include any references to his relationship with the former Sith Emperor. I totally would have romanced him too if that had been an option. Picking a favourite smuggler companion wasn't easy as I feel that the smuggler has probably the most well-rounded set of companions, but after I had given it some thought, I decided that the one I would miss the most if I were to lose her would be Risha. She's probably one of the most resourceful and clever companions you get in the game, without coming across as being over the top (I'm looking at Gault here...). On both of my lady smugglers she always came across as the kind of friend with whom you could go and steal horses (tauntauns?) and was simply a joy to have around. She also has one of the more interesting companion stories, revealing her to be someone with a serious agenda. I disliked Khem Val immensely when I rolled up my first inquisitor, because I wanted to be light side and I didn't want to be told at every turn that this made me weak and a bad Sith. It didn't help that inquisitors don't get their second companion until Tatooine. But the end of chapter one really turned my perception of Khem Val around. In his own way, he's very loyal, and he actually has a certain deadpan sense of humour. A Sith inquisitor without his or her pet dashade just wouldn't be the same. This one will probably surprise a lot of people, because wherever I go, I only ever see a lot of hatred for Quinn. Don't get me wrong, there was a point in the Sith warrior story when I wanted to kill him too, and I totally would have done so if it had been an option. But it wasn't; we had to move on, and I kind of got over it. Aside from that "little hiccup" I always liked Quinn. He could be kind of whiny, but I actually found that kind of amusing. You're whining to a Sith about your petty little problems? You clearly have some guts! Other than that he's shown to be pretty resourceful, and romancing him is a funny subversion of the trope of the shy girl being swept off her feet by some rough guy, with Quinn constantly blushing and being mortified whenever my rough-and-tumble Marauder flirted with him. 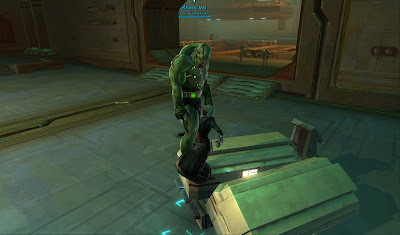 Despite of having levelled two of them, I can't say that I have much of a connection to the bounty hunter's companions, probably because I never spent all that much time playing with them. If I had to pick one I definitely wanted to keep however, it would be Mako. 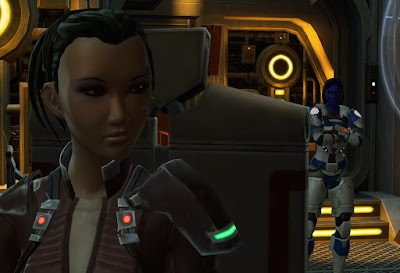 In general I feel that the "quirky young girl" character is kind of overused when it comes to companions in SWTOR, but out of all the ones that fit this description, I probably like Mako the most. She can be a bit whiny, but she always felt a bit like a little sister to my bounty hunters. She's also incredibly devoted and very clever in certain ways. I can forgive her more naive moments because they are usually caused by her sheer enthusiasm for all things hunt-related. We'll see if all these guys and girls will still be with us come coffee time... feel free to share your own picks for favourites you'd like to keep! I can see Risha too, although I've never leveled a female Smuggler so I don't know what Corso is like that way. I personally would have chosen Elara over the droid, mainly because she's the companion that makes Aric look like a wild and crazy guy. And I do have to admit that her story is interesting in its own right. When you're playing a female smuggler, Corso is either vaguely endearing in his backwards attempts at being a gentleman, or a stupidly annoying sexist. 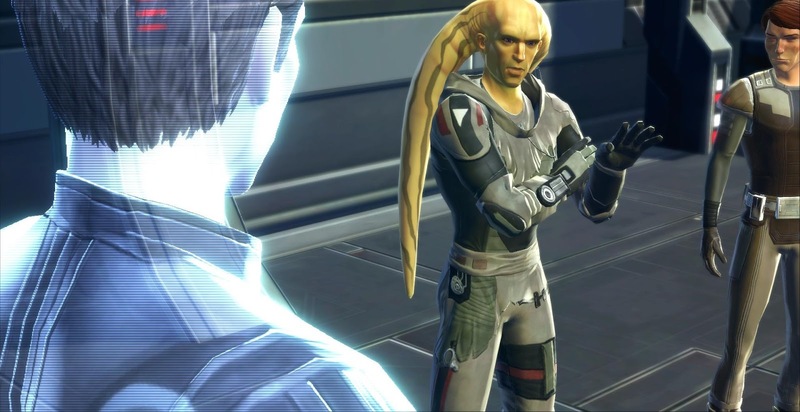 I like Elara too - as I said, I like most trooper companions. But nobody can beat good old 4X and I was trying to limit myself. Unpopular opinion: Quinn is my favorite companion, hands down. The first time I met him, I thought he was a total riot in his uptightness, and with time he grew on me even more than Vette (and I have a massive crush on Vette). Other than the "not-so-little hiccup", which was poorly handled, I found his story compelling and his personality endearing in a weird way. I kinda got over "the incident" too, although we really needed some follow-up on it. Really hope I get to keep him. I agree with you 100% about Lord Scourge. I will be very unhappy if we don't get to see him in KOTFE. I'm still disappointed that we didn't hear any dialogue from him in SOR. I also agree with you about Quinn. I don't hate him to the extent most seem to lol. I have mixed feelings about him. So I'm looking forward to seeing what he's like in KOTFE. I don't think he'd betray you again. Too Many Alts or Not Enough Variety?